As mentioned in a previous post, this is my first time through the legendary Harry Potter series. I'll be writing up mini, speed-reviews until I complete the whole bunch - and then I'll offer up a mega-review of them all. 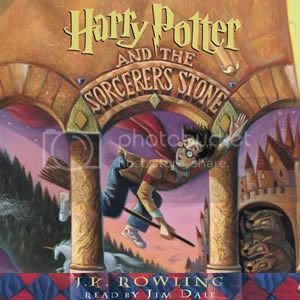 Rowling spends this book introducing us to her boy wonder, Harry Potter (a.k.a 'The Boy who Lived') and his quirky chums Hermione Granger and Ron Weasely as they battle trolls and the semi-resurrected Lord Voldemort. The audiobook set I have is read by the very awesome Jim Dale. Dale is a master of many voices and his Professor McGonagall, Dumbledore and Hagrid are brilliant. Unfortunately though, his other female voices have much to be desired. I really enjoyed the story although I did find it quite painful to start off with. I just found the vocabulary, similes and metaphors to all be pretty standard and repetitive, which became quite difficult to listen to. But, regardless of all that, I was surprised that I enjoyed the plot and characters as much as I did, as I really did not enjoy the movie as much. Ah well, never judge a book by its movie. So that's it for now. 'Stay tuned' for more Harry Potter speed reviews!